Recently Casey and I have really been struggling to work date nights into our routine. Life has changed with Ashlynne being here. We aren’t on our own schedule anymore and often find ourselves tied to her softball schedule and homework routine. Plus, she’s not really a fan of being home alone at night. 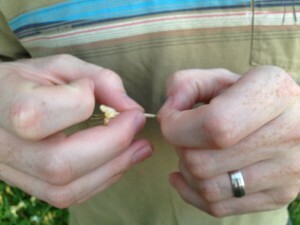 That can make one-on-one time pretty difficult, which eventually leads to times like this one I recently blogged about. Not good. Anyone that’s married knows date nights are essential to maintaining emotional connection with your spouse; however, they also know, especially if they have children, that date nights cannot always be a night on the town or even dinner at a local restaurant. And you know what? Sometimes date nights like that don’t leave you feeling anymore connected because you forget to be intentional about conversation that draws you closer. The first key is scheduling time together, even if it’s just an hour a week. Put something on the calendar and keep the commitment. For Casey and me, this is going to be Wednesday nights. That usually seems to be a night that doesn’t have too much going on, and sometimes Ashlynne goes to youth group with a friend. So that’s our scheduled time together, but what do we do and how do we connect, even if we can’t leave the house or have only an hour to spare? That’s where my friend, fellow blogger, and past Wednesday Wife, Cassie Celestain, comes to the rescue. If you read Cassie’s marriage story, you probably remember that she has a heart for communication in marriage. Her blog, True Agape, makes that clear as well. So she’s been working diligently over the last few months to put together an amazing resource to help us all make date nights at home intentional and fun! Cassie’s eBook, Creating True Agape, is a guide to making at-home date nights fun and easy! There are 20 engaging at home date night ideas that cultivate communication, intimacy and growth without you even realizing it. She’s done a fantastic job of walking us through each date idea by providing a list of materials, activity description, focus topic, step-by-step directions, discussion starters and even printables. Dare I say that these date night activities that you can do in your home will leave you even more connected to your spouse than a fancy dinner or night at the movies. Casey and I are going to be plowing through these date nights over the next few weeks since moving and a big baby in my belly will have us close to home for dates nights and short on creative ideas. I’m especially looking forward to the SPA AT HOME date night! I highly encourage you to purchase this eBook while you can get it at the discounted rate. Even if you can’t see yourself using it now, it’s a great resource to have on hand for those days when the thought of planning a quality date night is just overwhelming. Because my Love Truthfully readers are AWESOME, Cassie is making sure we get the launch special price of $9.95 from April 30 – May 2. Then the price will go up to $14.95 from May 3 – 9. After that you’re looking at the full price of $19.95, which is still a great deal, but who wouldn’t want to save 50%! 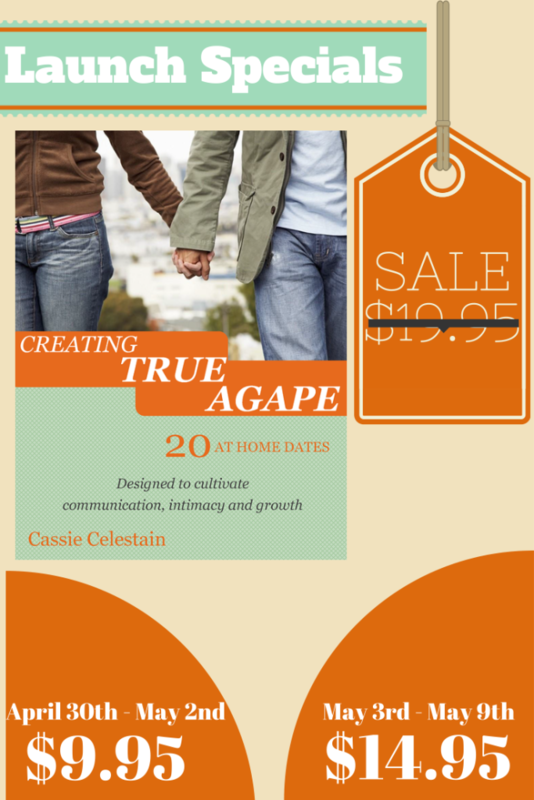 So don’t wait to order your copy of Creating True Agape – 20 at Home Date Night Ideas! I can’t wait to hear what your favorite ideas are and how these date nights ideas bring you a your spouse closer together! The other night, Casey and I enjoyed a long overdue date. It didn’t start out enjoyable though. I made the mistake of bringing up, again, how long it had been since our last date. Then Casey made the mistake of getting upset with me about it and striking up a disagreement right before we were supposed to walk out the door. Poor timing. Everything in me just wanted to forego our dinner plans and stay home. He went outside and told me to meet him there when I was ready. I sat on the bed contemplating what to do. I had feared that the night wasn’t going to go well. It never does when we’ve been disconnected for a while and then try to connect on a date night. It feels forced, not genuine and usually, the reason behind our disconnection rises to the surface. Not pretty. I felt that my premonition was coming true before we ever left the house. All I wanted to do was lie back into the bed I was sitting on and sleep. I was exhausted and not in the mood to pretend to like my husband or waste $40 on a meal just to fight the whole time. I began typing a text to him saying I wasn’t going to dinner with him, but I stopped for a minute to think before sending it. At this point we have two options. 2) or continue with our plans and pray that things resolve and don’t get worse. Although I wish I could say I chose the latter because I wanted things to turn around for us, it was really superficial motivations. I figured I already had makeup on, and I was really quite hungry so… I might as well go. I got up and headed to the closet to throw on my black dress and heels, taking my time, giving myself a mental pep talk as I went. A few minutes later, Casey came storming inside, assuming I hadn’t moved from my spot on the bed. Who knows, maybe he was coming in to say he didn’t want to go anymore. Whatever his intentions, he saw me in that black dress, getting ready for our date and things changed. He commented on how good I looked then waited for me on the couch. When we headed towards the door he hugged me and said he was sorry he hadn’t been making date night a priority. I wasn’t ready to repair so I headed to the car, silent. I was being obedient, taking steps toward him, but my heart was still hurting. We began to discuss the situation on our way to dinner. Usually not a good move, but this time it was, at least in the end. He began to ask me why I keep bringing up our lack of quality time, and I was able to express how him not scheduling dates with me made me feel like I’m not a priority and that he doesn’t care if we have quality time together or not. That’s what it communicates to me. he said something about not having enough time because September has been such a crazy month. Apparently he hasn’t been reading my blog. We have to steal time for things that are a priority for us. We schedule date nights and make room for other things, not the other way around. I felt like he was understanding my heart, but then things went down hill. He began telling me how he has been helping around the house. Have I noticed? Apparently my verbal appreciation was not enough. He wanted physical affection and emotional connection in return for his service to me. Last time I checked, we have to spend time together for that to be possible. I was angry. But the real issue for me here is not that he’s hurt, that’s valid and should be addressed. However, it seems like whenever I am hurt about something and we begin to talk about it, the conversation almost always turns toward him. He tells me what I’ve done wrong. How he has been hurt. Why he hasn’t been emotionally connected. Whenever this happens, it feels so selfish. It feels like he sees my hurt and just looks to himself, not to me, and says “yeah, but what about me?” Almost like him being hurt means I can’t be or there’s no need to repair because 2 hurts make a healing. The more we talked about it, it became clear that Casey waits until I start conflict to share his hurt. Although he’s come a long way, he still kinda fears conflict, which is pretty normal. That fear can keep him from bringing up hurts or anger to avoid conflict. Then once my loud mouth pulls us into conflict, which he can count on like clock work, we’re already there so he might as well bring up all my wrongs he’s been avoiding. Transparency and understanding can have such healing powers, even if it doesn’t mean we’ve necessarily “fixed” things. We began discussing future date nights and putting them on the calendar, together. We were finally moving towards each other and just in time because dinner was right around the corner. We walked in holding hands, (we weren’t even faking it! ), grabbed a small table in the corner on the upper patio, and enjoyed a delicious meal and even better conversation. It’s times like this that I’m thankful for the power of the Holy Spirit because it was that small decision to step towards him instead of away from him, when everything in me wanted to call it a night, that helped bring us to that point of reconnection, and Lord knows that move wasn’t my idea. 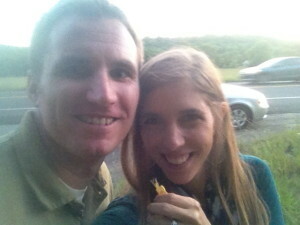 Yesterday Casey and I were driving home from an amazing date night at Arrington Vineyards when I mentioned the smell of honeysuckle. I began telling Casey about how that scent of summer reminds me of playing softball because we would always eat the honeysuckle near the fences. He didn’t know what I was talking about. It didn’t take me long to realize that I was about to get to introduce Casey to something new and take him to my childhood for just a moment. As we drove down this long back road we saw honeysuckle everywhere we looked. I kept urging Casey to stop, but with a 55 MPH speed limit and a sun setting behind us, he wasn’t exactly up for a detour. I almost had given up hope for my little adventure when he jerked the car off the road into a patch of gravel. There it was. 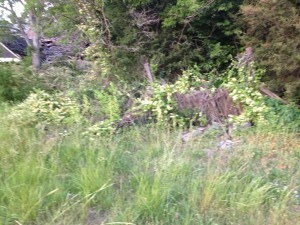 Right in front of an old, rundown home. A huge honeysuckle bush right there where we could reach it. 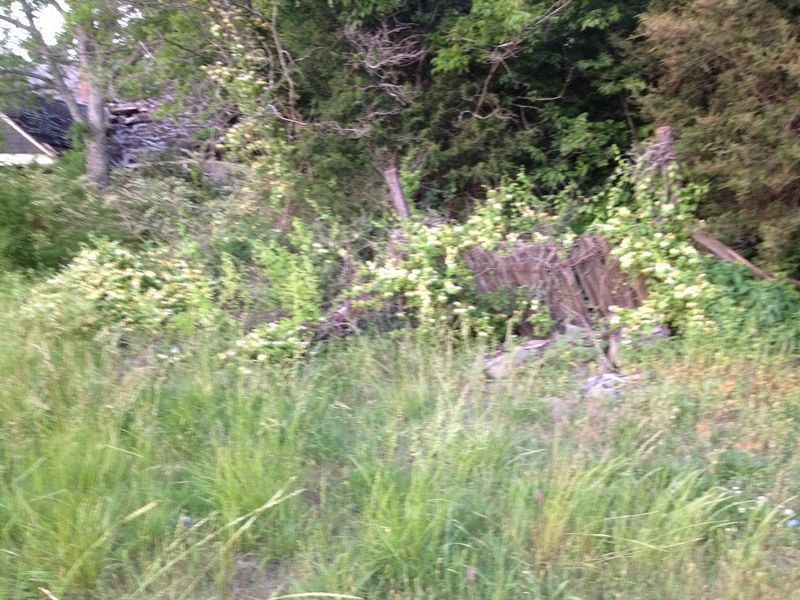 We ventured out of the car and headed to the bush – lured by the scent. I instructed Casey on how to select his flower. “Do we eat the flower?” he asked. “Even better!” I said. 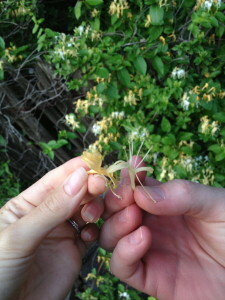 I showed Casey how to pull the stem out of the end of the flower and watched him enjoy the sweet nectar. Although it’s just a drop, the taste was a highway to childhood memories for me. Casey was surprised by how good it was and clearly enjoyed the process of gaining the nectar as much as I did. Now I have a new memory to add to the old that will come to life at the smell of honeysuckle. Sometimes we are so busy driving 55 down the highway that we never embrace the detours. That has to change. Because nothing really compares to sharing something new with your spouse. Teaching them a secret. Sharing your past in a tangible way. Making new memories. What memories have you been making lately? Casey and I had a whirlwind summer. It was full of family, traveling and was really quite enjoyable. Despite all the craziness, Casey and I stayed emotionally connected and really enjoyed each other’s company. That made it even harder to deal with what was waiting for us at home. With summer coming to an end, Casey returned to teaching. I was left working at home, alone. 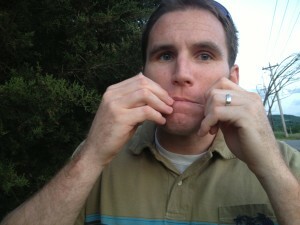 It didn’t help that Casey’s mono had kicked in again. He’d come home and go straight to sleep. It didn’t take long for us to disconnect. Before I knew it, we had been disconnected for a couple weeks, and anger oozed from my lips with every word. Feeling alone and angry don’t usually bode well for reconnection, but like always, it eventually came to a head. We both spoke the obvious. We needed to reconnect. 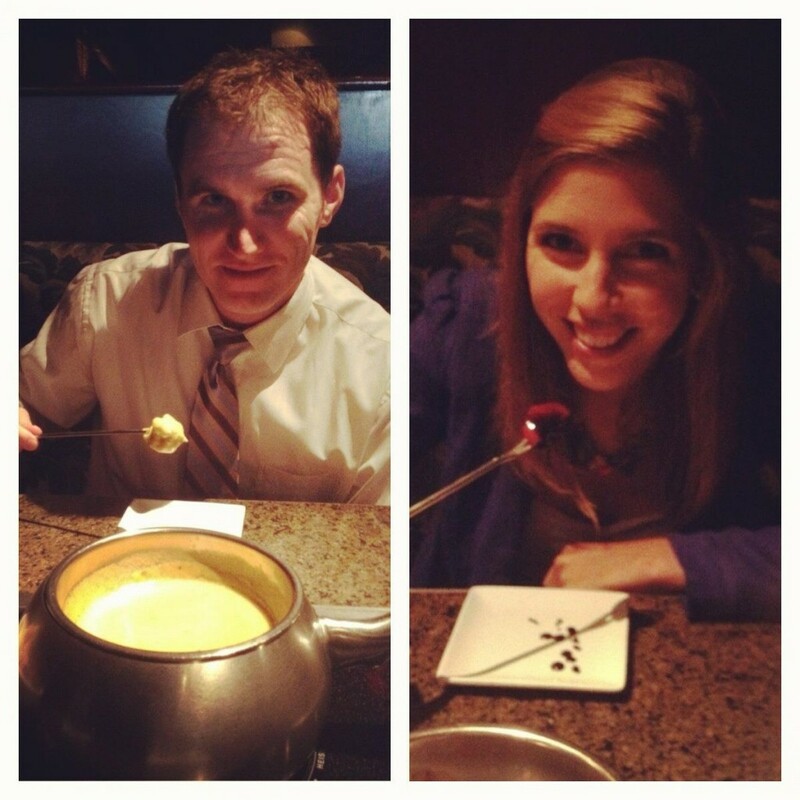 Thankfully, Casey initiated by writing me a beautiful letter and inviting me on a date night to The Melting Pot. Ahhh yes… The Melting Pot! It’s a magical place where people fall back in love and sparks fly. Just getting dressed up and going on a date like that guarantees reconnection… right? We were a third of the way through our date when Casey’s comment about how pretty the table was proved fancy hair, nice clothes and an expensive meal do not equal reconnection. But I wasn’t going to let us leave there disconnected. “I want to reconnect with you,” I told him. That’s really all it took. The praise of the table and food turned into conversations about having children (lots of them if Casey has his way), our favorite memories from the summer and how far we’ve come. We left there reconnected, wishing it wasn’t a school night so we could let the date continue. So we discovered that The Melting Pot offers no more magic than leftovers at our kitchen table, and that real reconnection takes real effort. How do you intentionally reconnect with your spouse?